“The piece of music is worked out by the composer, but it is the performance we enjoy; thus the active and emotional principle in music occurs in the act of reproduction, which draws the electric spark from a mysterious source and directs it to the heart of the listener.” These words from music critic Eduard Hanslick’s book, The Beautiful in Music (1854) should have been ringing in the ears of those fortunate to be at Prague’s Rudolfinum Concert Hall on the 28th of September for the highly anticipated all-Rózsa event entitled, “Epic Hollywood – The Music of Miklós Rózsa”, featuring the famed City of Prague Philharmonic Orchestra under the very competent direction of Nic Raine. Hanslick was actually born in Prague (when it had been part of the Austrian Empire) and eventually supported and advocated the music of Brahms, a composer much admired by Rózsa. In Frank K. DeWald’s enlightening notes point out that the composer never sacrificed his commitment to the strong musical values ingrained in him during his training at the Leipzig Conservatory…..steadfastly pursuing his passion for composing works for the concert hall while enjoying the rewards of being one of the most admired and celebrated artists of Hollywood’s Golden Age. 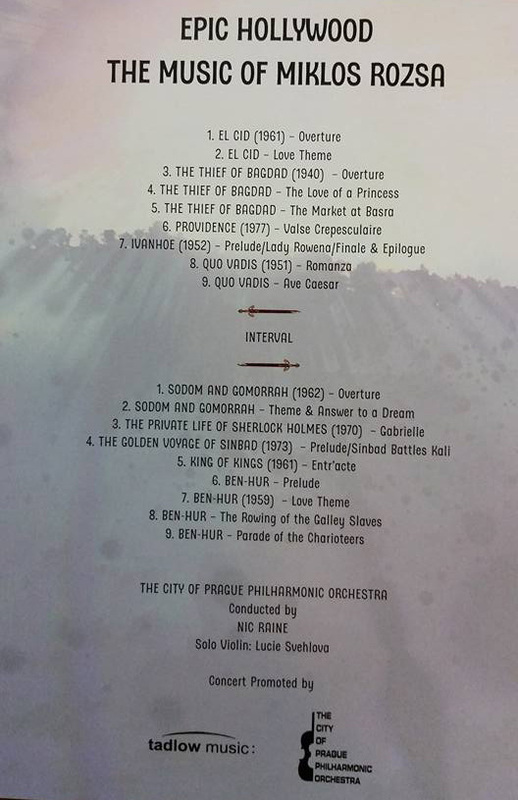 And of course it is these latter vibrant and colourful scores that have meant the most to legions of great film music lovers through recordings - or concerts, such as this latest one in the Czech Republic’s beautiful capital city, the home of the orchestra that has become renowned the world over for consistent reliability in film music making. Founded over 60 years ago, group was given its current name by James Fitzpatrick in 1992, and its members are selected from the finest musicians from all the main Czech orchestras. The superb results are plainly evident, and a total of four major Rózsa recordings to date testify not only to their obvious talent, but as importantly to the on-going working relationship with the experienced Nic Raine. He had even worked with Rózsa, by assisting Christopher Palmer on the orchestration of some later scores, but has also collaborated extensively with many other composers and musicians, especially with the late John Barry. He has conducted over fifty film music recordings for Silva Screen and Tadlow Records, with the latest, just released, a truly magnificent two disc set of the complete Sodom and Gomorrah score – the second by Rózsa to appear on Luc van de Ven’s Prometheus label. Both this recording and the concert neatly mark the twentieth anniversary of the composer’s death in 1995, and are therefore doubly welcome, coming together as they do. Ever since that other superb Rózsa-fest in Cologne in February, many of us in Europe had been eagerly awaiting this second one, as soon as James Fitzpatrick announced his intention to mount it six months ago; so it was that some dozen and a half of us (probably even more) were able to make the pilgrimage to this fine city from Germany, Spain and the UK, all intent on fully enjoying another unique occasion to support this daring endeavour and ensure as rousing a reception as we could muster. 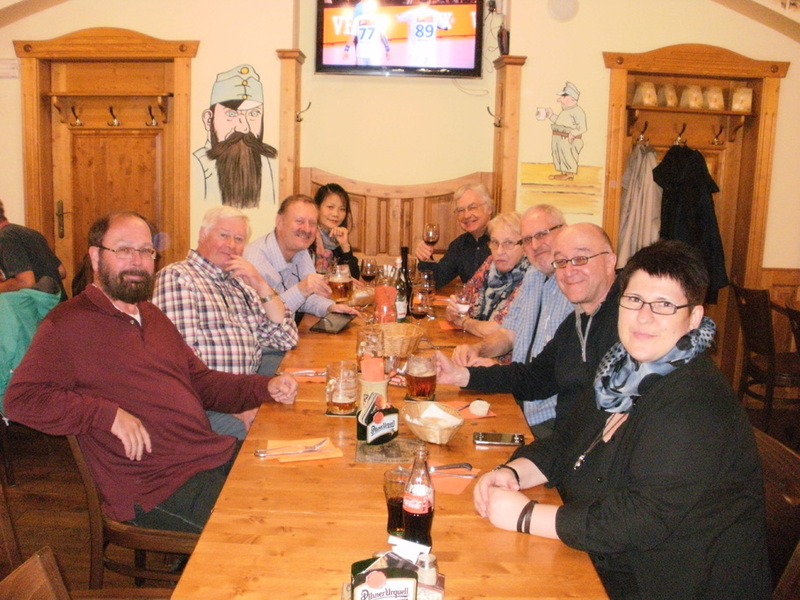 Those evident were, Volker and Dorothee Hannemann, Harald Bayer, Joachim Sejans and his friend Alex, Udo Heimansberg and his son Erik, Antonio and Trinidad Castillo Gómez, Stephen Torlop, Chris and Maura Elwell, James MacMillan, Andrew and Peiyuan Knowles, Doug Raynes, and my wife Sheila and I. This band of merry men and women were well pleased with what they heard; however, even more thanks were owed to James who invited some of us to the rehearsals the day before at Smecky studios, the regular venue for the recordings made with this orchestra. 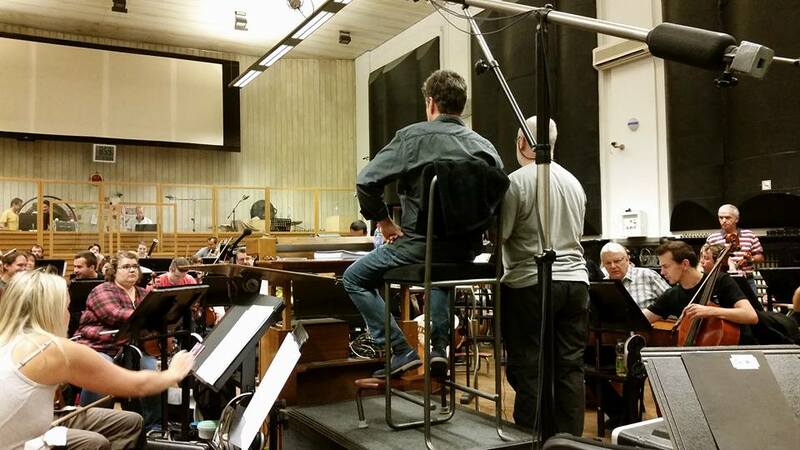 The studio is quite small, with few available places for visitors to attend comfortably and unobtrusively, as some of us had remembered from previous sessions to which we had been invited for other Rózsa re-recordings. Therefore, we sat split in small numbers for the morning and afternoon sessions, eager to hear the scores chosen for the big event itself the following night, but it was also good to meet up briefly with Nic, James and Lucie Svehlova, the orchestra’s leader, in between the various selections being played. 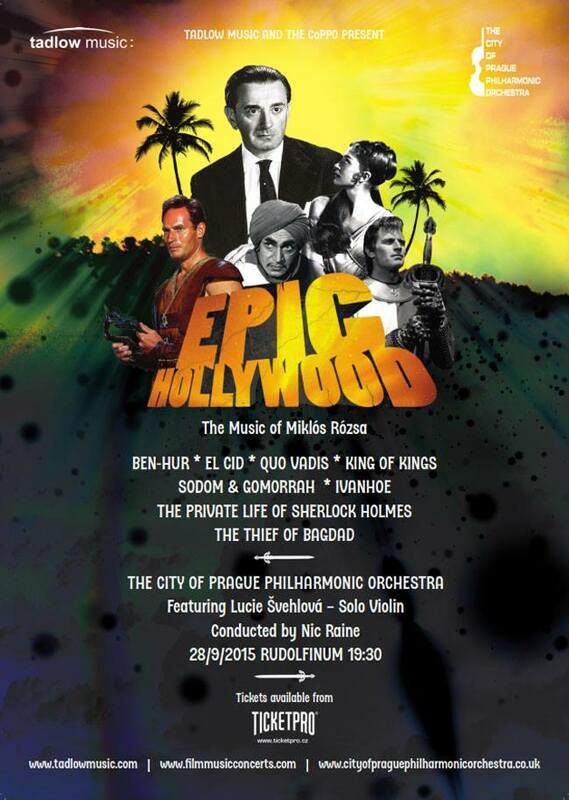 The emphasis was naturally on the three famous Roman epics (QV, B-H and KOK), plus El Cid (Suite), Ivanhoe (four sections arranged together), Thief of Bagdad (Overture, Love of the Princess and Market at Basra from the Suite) and The Golden Voyage of Sinbad (Prelude and Battle with Kali). 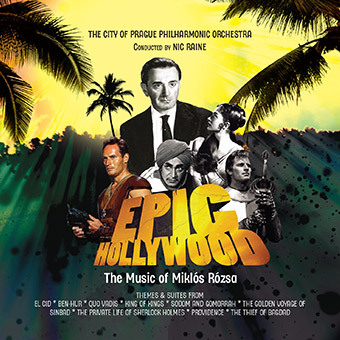 Two other films were also included, neither being epics at all – but presumably added for contrast and to show a different side to the composer’s career in the movies. These were Providence(Valse crépusculaire, arranged for piano and strings, plus the explosive Finale); also The Private Life of Sherlock Holmes (Gabrielle) which joyously highlighted Lucie’s exquisite playing to perfection. James Fitzpatrick with some of the guests at the rehearsals. At the concert the day after, many of the accounts of these scores were large scale and highly charged, with the most effective kind of balance between the spry, the powerful and moments of sudden unexpected expressiveness in the melodic line. Raine inspired some splendidly exuberant playing – from players who seemed to naturally have the stuff of Rózsa’s music in their bones: vividly sympathetic, exhibiting enjoyable vigour and spontaneity, and no lack of delicacy when called for. At times the unusually obfuscating acoustic in the hall made it hard to fully determine precisely which sections were playing what (to this listener’s ears at least), but the end results emerged triumphantly to long and loud and lasting applause, with a noisy standing ovation sweeping around the grateful audience. The joyous excitement was rapturous, so much so that two encores followed after the climactic “Parade of the Charioteers”: the El Cid March, and one of the “Castles of Scotland” alternate versions from The Prvate Life of Sherlock Holmes . 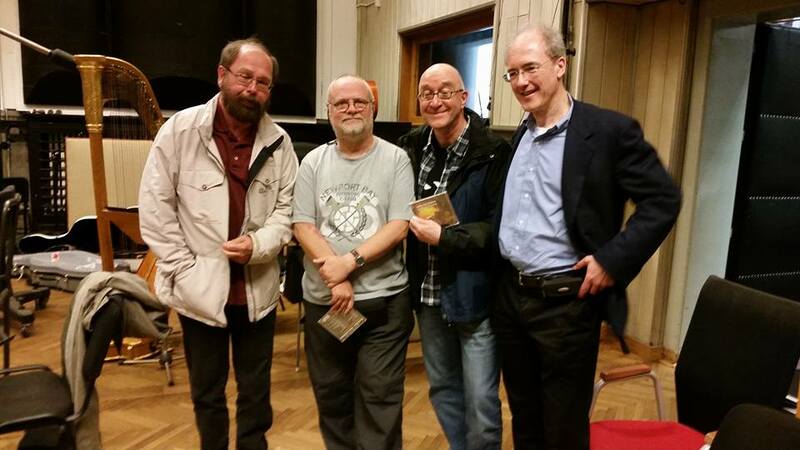 It concluded a wonderful evening celebrating the film music of Rózsa which few of us will ever forget. 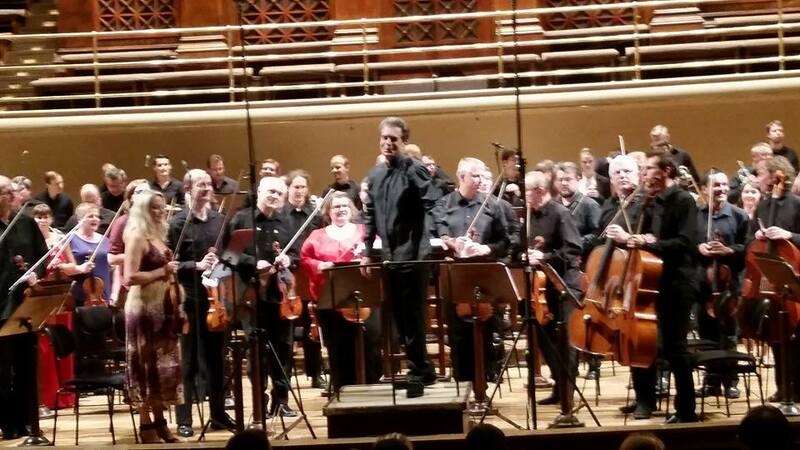 The orchestra under Nic Raine’s skilful direction had won the day, and resulted in an evening both immensely satisfying and spiritually exhilarating. James had arranged for many of us to join him at a post-concert supper nearby, along with Nic, Lucie and other members of the orchestra; this was a very kind gesture by him enabling us all to discuss all that we had just witnessed, and indeed the whole weekend of memorable events, musical and otherwise. So it was that around midnight we returned to our hotel, euphoric with impeccable musicianship ringing in our ears, seemingly rising up off the romantic Vltava River nearby….. Prague – and Rózsa can obviously be a heady mix! It had me musing over the words of Ralph Vaughan Williams, when he suggested that the art of music above all arts is the expression of the soul of a nation. “The composer must love the tunes of his country and they must become an integral part of him”, he declared. Once more the Hungarian tunes of Miklós Rózsa had been apparent in so much of what we heard that evening; his soulful yearning yet again stirred a nation’s heart. We are surely ever grateful for that. View or join discussion on this concert at the Forum. 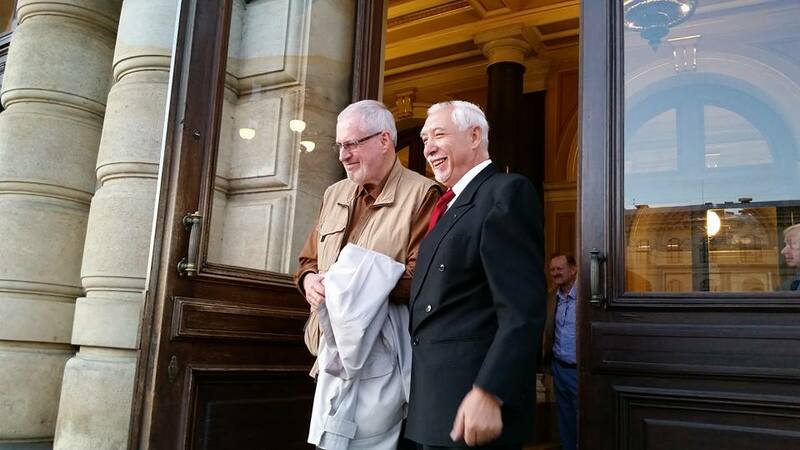 Antonio Castillo Gómez with Alan Hamer outside the Rudolfinum Hall. outside the Hall (Andrew Knowles, Volker Hannemann, Alan Hamer, Doug Raynes, James MacMillan and Peiyuan Knowles). 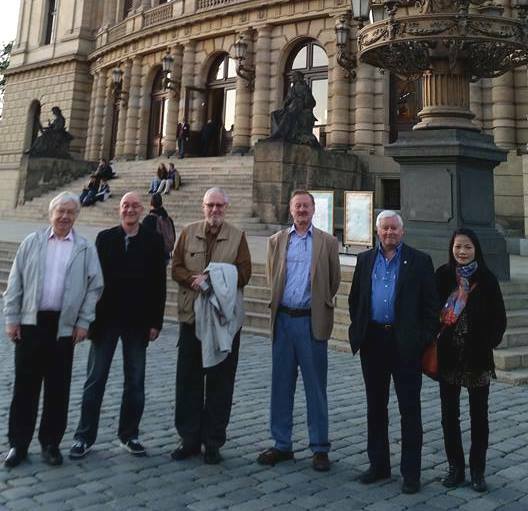 Prague Café-Harald Bayer, James MacMillan, Doug Raynes, Peiyuan and Andrew Knowles, Sheila and Alan Hamer, Volker and Dorothee Hannemann. Janet Fitzpatrick and Lucie Svehlova at the post concert supper.